A properly dried structure is a healthy structure, improper drying efforts can result in secondary damages such as water staining, odors, mold growth, and compromised structural integrity. Un-Flood-It guarantees your drying projects against secondary damages. Our project managers will monitor your project daily, utilizing our infrared imaging camera as well as other tools to insure accuracy and efficiency during the drying process. Providing accurate documentation regarding your project is what we do best, moisture readings, digital photos, infrared images, a complete written report of all activities is a standard. Providing you a level of confidence that only Un-Flood-It can give. Hardwood and tile floors require special attention from restorative drying companies. Many people believe that replacement is the only option when their hardwood floor is effected in a water loss. However, this is not always the case. If Un-Flood-It is called into action on a water loss before the floors have begun to buckle (buckling occurs when the nails begin to pull through the floor) in most cases we are able to save the floor. Un-Flood-It can formulate a plan to put our Injectidry system to work for you. 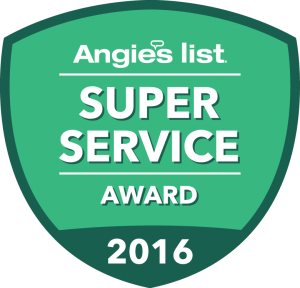 This top rated equipment, when paired with our hardwood floor drying panels, have saved many homeowners and insurance companies thousands of dollars in replacement costs. 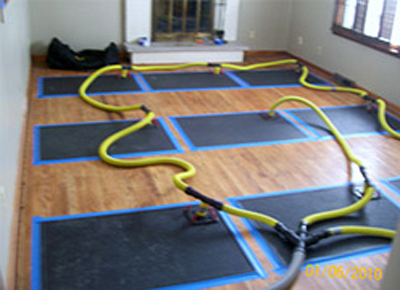 The black panels you see in the picture to the left have been placed on the hardwood floor with an air tight seal placed around the edges. The small yellow lines that you see are then attached on one side to holes in the panel. The other end of the line is connected to the larger yellow suction line. This line is connected to the Injectidry system forming a suction underneath the panels. Air will travel from between the subfloor and the hardwood floor through the grooves between the boards, bringing with it any moisture. This system combined with very dry air from our desiccant dehumidifiers will pull the moisture right out of the wood. 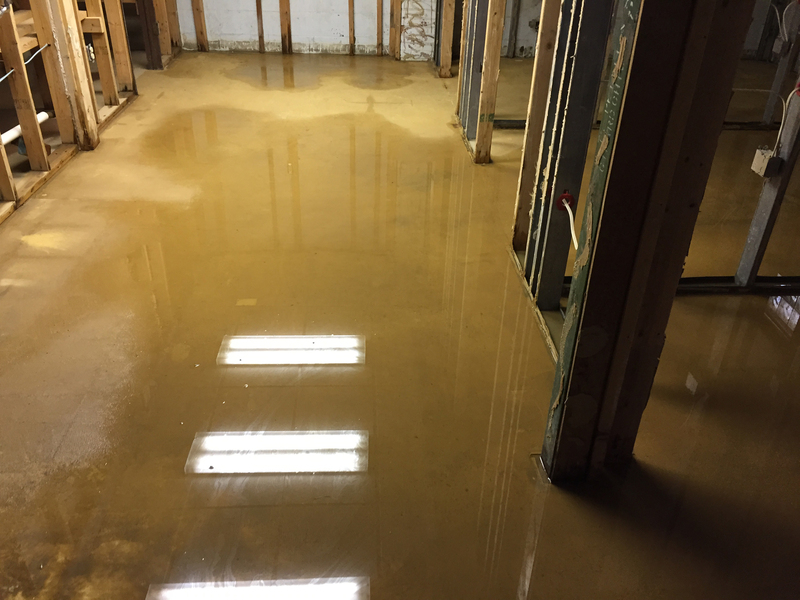 When dealing with any water loss, a fast response time is a critical factor in mitigating the loss, and it is especially important in the case of hardwood floors. The longer they are wet, the greater the chance that buckling will occur. So the next time you’re dealing with a wet hardwood floor, don’t just count it as a loss, count on Un-Flood-It to get it dried in a hurry! Here is the difference between cupping and crowning. When water is left on a wood floor, or if excessive moisture rises from below the subfloor, it becomes trapped between the wood floor and the subfloor. 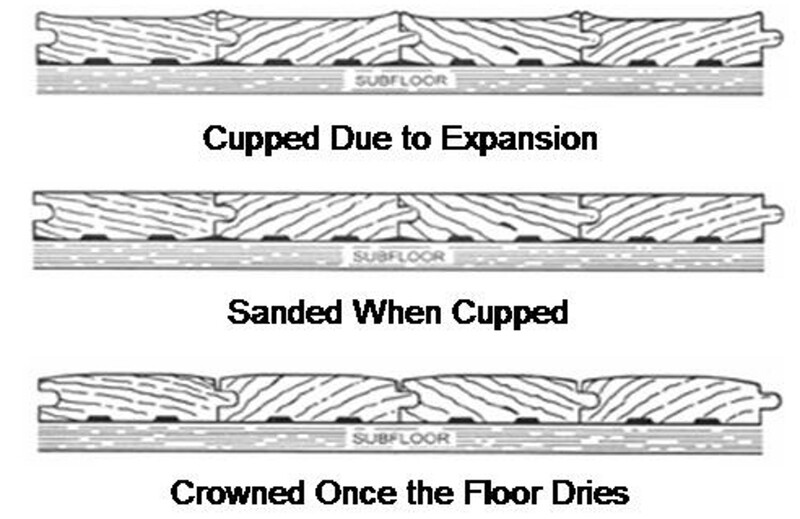 Cupping (left) occurs when the top of the wood dries faster than the bottom of the wood or when the moisture is absorbed by the underside and causes it to expand, raising the edges. The biggest mistake that can be made is to sand the floor flat while it is still retaining moisture. This leaves the wood with thinner edges than the center. After the floor dries completely the edges shrink and flatten back into position, but now since the top of the edges have been sanded, the center of each strip is higher the the edges. This is called a crowned floor. If you have hardwood or tile floors that are involved in a water damage loss be sure to ask your insurance company and your restoration company how they are going to be handled. If you are told that they will need to be replaced, ask “Why don’t you simply dry them?” This industry has been raised on a system of ripping out and replacing (dumpster feeding), but those days are over, there is a possibility that it can be dried in place! After most hardwood floors are dried and settle back to pre-loss condition, they are restored and don’t even need to be refinished!